If your Physio or Doctor has suggested that a brace or orthosis may assist your child, we are always happy to assess your child and give you an honest opinion on whether we can help. Orthoses can help many conditions. There are many musculo-skeletal and neurological conditions that orthoses can help with. The list shown above is some of the more common conditions that our Orthotists have experience in helping to manage. This list is by no means exhaustive. All our patients are individually assessed and our orthoses are customised or custom-made to each person’s needs. We are very aware of the need to provide something that is as effective as it can be, without it being difficult to use. Patients who are affected by Charcot-Marie-Tooth disease usually have a progressive weakness of certain muscles which can affect standing and walking stability. 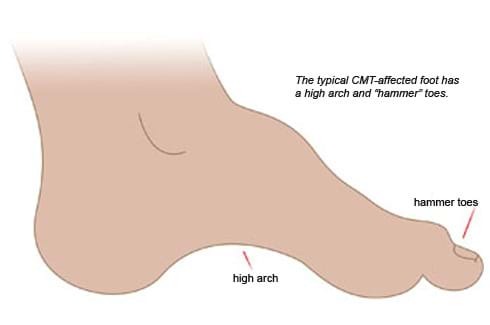 Cavus (very high arches of the feet) and foot drop are common in CMT. The dorsiflexor muscle group, which are responsible for clearing the foot when walking, are usually the most affected, causing foot drop, calf-tightening and tripping. There are a range of orthotic devices that can be designed to help people affected with CMT. These include foot orthoses to re-distribute the weight under the feet, and AFOs to help improve gait and prevent calf contracture. AFOs for CMT are usually lightweight carbon-fibre designs. These allow relatively normal movement while the foot is planted on the ground, but lift the foot up while the foot is swinging, so that the toe does not catch on the ground. When carbon-fibre designs are not appropriate, more traditional AFOs can be used such as leaf-spring or hinged designs. An alternative to traditional AFOs are silicone AFOs. These are custom made from a reinforced silicone rubber that fits tightly around the foot and ankle. They are designed to prevent dropfoot but unlike other AFOs, they can be worn barefoot. This means shoe-off freedom without tripping! Down syndrome is a genetic disorder caused by an extra chromosome, which results in a range of physical and developmental characteristics. A combination of ligament laxity and low muscle tone contributes to foot and ankle problems in children with Down syndrome. Children will often experience flat feet and unstable ankles which can contribute to a decrease in balance, difficulties or delays in gross motor skills such as walking and jumping and a wide base of support during standing and walking. Orthotics can help your child by supporting the foot and ankle in a corrected position, to improve foot posture when weight bearing, and in turn improve postural stability. Correcting your child’s foot position at a young age can also help to prevent future foot problems. Depending on the level of support required foot orthotics, SMOs (supermalleolar orthotics) or AFOS (Ankle Foot orthotics) may be used. Foot orthotics - used to correct the arch of the foot and prevent it from collapsing into a pronated position. SMOs – provide support to the heel as well as the arch of the foot – providing greater control over foot position. AFOs – provide a greater amount of support to hold the whole foot and also the ankle/lower leg in a corrected position. Nerve injuries or lesions are caused by a variety of things including trauma, disease or a surgical complication. Nerve injuries cause a loss of muscle power and loss of sensation. Dropfoot is the result of injury to the common peroneal nerve. This supplies the muscles that lift the foot while it is swinging, preventing tripping over the toes. When these muscles are weak or paralysed, walking becomes difficult and dangerous. There are a variety of devices for treating dropfoot, from simple off-the-shelf ankle bands to light and strong carbon fibre AFOs, to custom-made thermoplastic or silicone AFOs. Nerve injuries to the upper limb, such as radial or ulnar nerve injuries, can cause a loss of the ability to position the hand to grip objects. 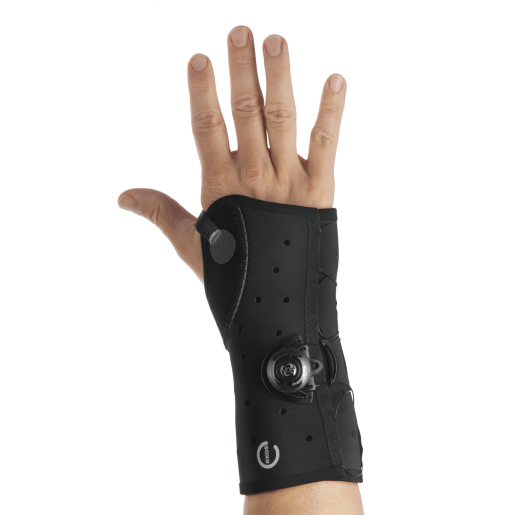 Orthoses can help to hold the hand in a position where it is more functional, such as a wrist brace that holds the wrist in extension where it would otherwise remain in a flexed position. Most orthoses for children with upper limb nerve injuries are custom-made as there are very few sizes available with off-the-shelf devices. They are either directly moulded to the limb using low-temperature thermoplastic, or made from a cast taken if the affected region. Spina Bifida is a congenital condition that causes paralysis and loss of sensation. The amount of motor and sensory loss depends on where the lesion is situated on the spinal cord, but essentially the higher the lesion the more disability is incurred. When the lesion is very low there is some minor foot instability which may require the use of foot orthoses. If the lesion is high enough to cause weakness to the calf muscle, then Ankle-Foot Orthoses (AFOs) are often needed to prevent a crouched gait. Carbon-fibre AFOs, Solid-Ankle or Ground-Reaction (GRAFOs) and Energy Storage and Return AFOs (ESR AFOs) can all be used depending on how much support is needed. Some people with low lumbar lesions are able to walk with AFOs, but as the quadriceps become weaker, higher support is usually needed. Knee-Ankle-Foot Orthoses (KAFOs) become necessary to prevent collapse of the knee in these cases. These may be manufactured with a lockable knee joint or a weight-activated lock to prevent knee collapse. With higher lumbar lesions, KAFOs are not enough support as the hip extensors are paralysed and the trunk is totally unsupported and will fall forward. Standing or walking without crutches or a walker is very difficult or not possible. A Reciprocating Gait Orthosis (RGO) can be used for ambulation or a rigid body brace connected to KAFOs (THKAFOs) can be used for standing. Lockable hip and knee joints allow sitting without removing the orthosis. Mild to moderate hip and knee contractures may be able to be accommodated in the orthoses. If the goal is for standing or limited walking with a thoracic lesion, a RGO or THKAFO can be used. Joint contractures of the knee and ankle are common in spina bifida due to muscle strength imbalance around joints. Contractures of the knee can be managed statically with three-point knee extension orthoses, or more dynamically with Monodos or Ultraflex dynamic brace systems www.ultraflexsystems.com. These devices are typically used at rest for a prescribed period. Foot and ankle contractures can sometimes be helped by the use of night splinting. Ankle-Foot Orthoses (AFOs), either pre-fabricated or custom made, can be used to reduce a foot angulation deformity. As a result of a traumatic head injury, stroke or the consequences of a neural tumour, the muscles of the body, particularly the arms and legs can be impacted. Paralysis or hypertonia interferes with walking and/or using the hand. Impacts may be mild inconveniences to devastating disability. Footdrop or calf spasticity: Weakness of the dorsiflexor muscles (that hold up the foot while off the ground) or calf over-activity cause tripping and poor foot placement. Various forms of Ankle-Foot Orthoses (AFOs) can be used here. Wrist and finger contractures: Due to wrist and finger flexor spasticity, the hand is unable to open and it becomes tight. Resting splints, both passive and dynamic can be used to prevent further tightening of the muscles or hold position after botox or surgery. Elbow contractures: Biceps overactivity can cause an inability of the elbow to extend, preventing use of the hand. Contractures may be successfully reduced through the use of dynamic orthoses, such as the Ultraflex system. Knee contractures: Spasticity or dystonia of the hamstrings can cause a knee flexion contracture, preventing full extension of the knee. Contractures of the knee can be managed statically with three-point knee extension orthoses, or more dynamically with Monodos or Ultraflex dynamic brace systems (www.ultraflexsystems.com). These devices are typically used at rest for a prescribed period. At Orthokids we have specialized expertise in helping people achieve their goals through the careful design and construction of our orthoses for the individual. Our Orthotists work closely with orthopaedic specialists, paediatricians, physiotherapists, occupational therapists and other health professionals to improve the abilities and mobility of children and adults with acquired brain injury. HSP is a familial disorder that causes weakness and spasticity (high muscle tone) in the lower limbs. In many cases it will resemble diplegic cerebral palsy, especially when the age of onset is in childhood. HSP can cause muscle contracture and walking problems. Foot orthoses and AFOs are used when these problems cannot be dealt with medication and physiotherapy alone. Muscular dystrophy refers to a group of neuromuscular disorders that cause progressive weakness and wasting of muscles. There are many different types of Muscular dystrophy that effect different people at different ages. Muscular dystrophy can reduce the mobility at joints, in particular the ankles, Orthoses can help to ease discomfort and reduce the rate of onset of joint contractures. Night resting AFOs can help to minimize progressive contractures of the calf muscles and to keep dorsiflexion range for as long as possible. These resting AFOs can be either pre-fabricated or custom made, and hold the foot into a position to allow a stretch to occur over night. In some cases orthotics such as AFOs or Foot orthotics may be beneficial for day time use. Pectus carinatum is a deformity of the chest wall, characterised by the sternum and ribs protruding and is most commonly known as pigeon chest. Pectus carinatum is most often seen in adolescents and usually in males. Pectus carinatum does not cause any functional problems, however it can cause children or adolescents to be concerned about their appearance. Pectus Carinatum, whilst still flexible, can be conservatively treated using a chest orthosis/brace to correct the shape of the chest. The brace is easily hidden beneath clothing. The brace is worn 16-20 hours a day until correction of the chest wall occurs (usually 3-6 months). It is then worn for about 12 hours a day to maintain correction – this is usually for another 3 months. Through-out the course of treatment you will be reviewed by your orthotist to check the brace is fitting and working correctly. Some conditions cause a stiffening of joints and orthoses are used to help protect from further movement loss or to enable walking. Other conditions cause an over-flexibility of the joints which may result in difficulty with movement or dislocations. Orthoses are used in these cases to control the mobility of joints and restore joint safety and function. Orthoses may include foot orthoses to support a hypermobile flat foot, to full leg Knee-Ankle Foot-Orthoses to prevent dislocation of the knee joint. We provide upper limb orthoses as well as lower-limb. All of our orthoses are individually designed to meet the needs and goals of each person. Knee problems can result from trauma to the leg or from congenital reasons. Our Orthotists help manage a range of issues that affect the knee, with both off-the-shelf braces and custom made knee orthoses. Ligament injuries to children are nowhere near as common in children and teenagers as in the adult population, but can be no less problematic.Bracing for Anterior and Posterior Cruciate Ligament (ACL and PCL) tears in the form of rigid knee braces are available. These are made from carbon-fibre or lightweight metal and designed to protect the knee against further damage or after surgical reconstruction. Custom-made knee-braces for ACL or PCL are able to be manufactured due to the wide range of shapes and sizes encountered, ensuring the best possible fit, comfort and protection to the knee. Medial or lateral ligament injuries can also managed by knee bracing in the form of hinged knee braces. These are usually off-the-shelf designs and there are many different products and designs available to meet the needs of each person's situation. Recurrent dislocations of the patella (kneecap) is not uncommon and will often need surgical correction in which a brace is used directly after surgery to limit motion and protect the surgery while the tissues heal. For mild cases, a patello-femoral knee brace can be worn to help prevent dislocations when walking or playing sport. We have access to a number of different designs of patella bracing that will suit the needs of each person’s situation. Blount’s disease is a disorder of development of the medial tibial growth plate in the knee. It causes a moderate to severe bowing of the shin and if untreated it causes major difficulties in walking and further compensatory problems at the hip and foot. It is typically seen in young children after onset of walking. It is not to be confused with normal physiological bowing of the tibia. Blount’s disease can be treated non-operatively through the use of a Knee-Ankle-Foot Orthosis (KAFO) with a special knee joint developed in the USA by Simplicity Systems www.blountsdisease.net. This KAFO system has been sucessfully used to correct the bowing and prevent major surgery. Early treatment of Blount’s disease is important. Osgood-Schlatter Disease is the name for a condition that affects the top of the shin, just below the kneecap. It is inflammation of where the tendon of the large quadriceps muscles of the thigh attach into the shin. It can be quite painful and causes a bony protrusion at the site of attachment. Treatment includes rest and physiotherapy. The condition will eventually resolve completely but the symptoms need to be managed. Orthoses such as knee bands which slightly change the direction of pull of the tendon and foot orthoses which change the tibial rotation, may be of some benefit to help manage children and adolescents get through this condition.